According to a recent report released by the Deloitte Center for Energy Solutions (DCES), "Connected Barrels: Transforming Oil & Gas Strategies with the Internet of Things," "... the falling costs and increasing functionality of sensors, the availability of advanced wireless networks, and more powerful and ubiquitous computer power... have collectively opened the floodgates for the amount of data that the industry can swiftly collect and analyze." This focus on data has given rise to a new term: the digital oilfield, comprising technologies, services and related business models to enhance data management in oil and gas activities. Data collection and analysis can help address key operator concerns on an offshore oilfield, where business challenges are myriad. Regulatory and environmental compliance; safety; response time to problems; productivity and efficiency; and asset protection all need to be managed in a remote, hard-to-access location. A new challenge is a decline in global oil prices, which has created an even greater push to reduce operational costs, increase uptime and improve processes. According to the DCES report, "[The] new normal of lower oil prices not only will lay bare inefficient oil and gas (O&G) companies but will push even the efficient ones to find ways to preserve their top and bottom lines." This means turning to technologies that can solve oil and gas industry challenges by allowing the oilfield to access and analyze continuous data streams. The more real-time data that can be gathered, the better decisions can be made, and the more efficiently the oilfield will run. If full data is available in real time or near real time, users can look at actual production information and failures in much more granular detail, boosting productivity. Engineers don't need to examine snapshots of certain time frames or windows to determine mean time to failures or average flow rates; the data is all right there, at their fingertips. Equipment can be fitted with sensors that send data continuously to a central collection point via the network, allowing operators to see patterns and prevent problems. Semi-autonomous or autonomous equipment can be controlled remotely via the wireless radios appended to sensors, meaning power can be killed before or at the time of an issue without waiting for a workboat to reach the equipment and an operator to turn off a valve or pump. Remote data gathering can lower operating costs and increase safety; employees can perform duties from onshore and collaborate with a few platform workers via camera. Fewer platform workers mean less transport to and from the platform, which minimizes transportation costs and reduces risk. Data like engine run time allow for proactive maintenance, and can help engineers catch problems with equipment and change their processes, saving money on cost of repair or replacement, and reducing downtime. On the safety and compliance side, proper environmental sensor packages can show gas leaks that technicians cannot smell, and control equipment can keep technicians in a safe zone if there is an issue. Sensors can detect leaks or changes in pressure and shut off a pipeline automatically. Some offshore vessels are stationed in places where piracy is a concern, and surveillance footage streamed over a strong network can keep infrastructure, people and assets more secure. Equipment and vessels also can be outfitted with GPS tracking devices to prevent and/or detect theft or piracy. Near-real-time evaluation of data also can help save on production costs. According to the DCES report, "Increased data capture and analysis can likely save millions of dollars by eliminating as many as half of a company's unplanned well outages and boosting crude output by as much as 10 percent over a two-year period." To capture this data, a digital oilfield needs sensors and devices on the rig itself, as well as on flotels and other vessels that surround the platform, that proactively and constantly communicate in real time via a wireless communications network. A communications network needs to meet the following requirements to adequately provide real-time data to an offshore environment. It must have high availability, high bandwidth and low latency: The conditions in which offshore oil and gas operations exist cripple many networks. Environmental or accidental radio frequency (RF) noise, broken RF equipment, dynamic changes in the characterization of the RF site, and the range on non-compatible RF devices all can interfere with wireless network performance, and any single-path or PtMP network has a single point of failure and reduces reliability. Therefore, a network should allow for and survive any changes to network infrastructure, whether planned or unplanned, by having multiple radios creating multiple paths, and thus no single point of failure. Even if a radio on one piece of equipment or vessel fails, the network should be able to reroute, limiting connectivity problems to an individual vessel versus multiple vessels, and ensuring that operations are minimally affected. Even on rough seas, a network should have enough peers that workboats tossing on the waves can still connect to it; a workboat may not have line-of-sight of the main antenna tower through the waves, but can "see" a peer workboat and connect via that boat's radio, maintaining connectivity. The U.S. Department of Homeland Security identified the energy industry as one of 16 industrial sectors so vital that "their incapacitation or destruction would have a debilitating effect on security, national economic security, national public health or safety, or any combination thereof" - and especially as cyber attacks on offshore rigs increase, a wireless network must stand up to cyber threats and protect critical data. 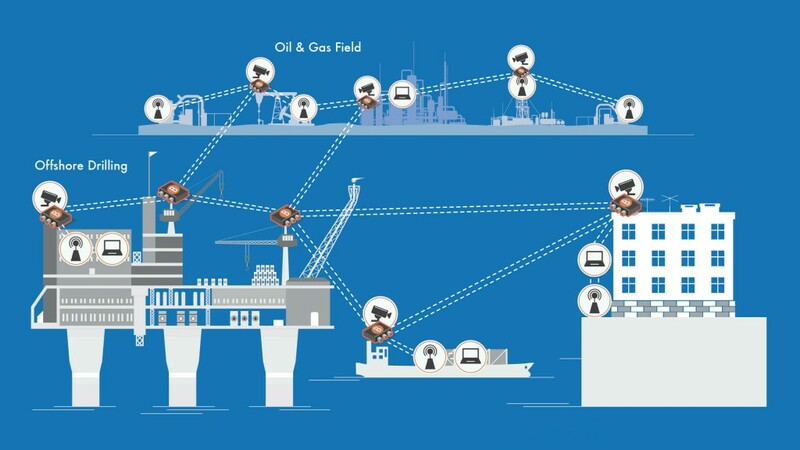 Networks with military-grade security with configurable per-hop, per-packet authentication are ideal for the offshore oil and gas sector. A network should offer end-to-end encryption - meaning when encrypted information flows through the network and comes out another radio, it stays encrypted all the way through, and is not decrypted until it is delivered to its final destination, ensuring privacy. It must be scalable and reconfigurable: Sometimes installation of a wireless network itself can be an issue. In the production field on a drilling rig, OSHA considers many areas Hazardous (classified) because of the possibility of explosions, which limits when, how and where a network can be installed. Installation, or any movement or redeployment of the network, in these areas, requires shutdown for safety reasons - and each shutdown can mean several million dollars in lost production. A network that requires a full shutdown of operations every time it needs to be redeployed or moved around the rig is not ideal because of the nature of the environment. Standard design and equipment cannot support the nomadic state of an offshore oilfield. A network should have assets that allow operators to reconfigure and move radios and network infrastructure as the environment changes. For example, there may be multiple vessels onsite during drilling, but support vessels leave when drilling ends, while others are permanent. With PtP or PtMP networks, operators need to completely redesign the network for the remaining vessels to scale it down each time new vessels leave, and then do it all over again the next time drilling commences and new vessels or equipment arrive. A scalable, re-deployable network makes it easy to move vessels on and offline, expanding and contracting the network as needed for each rig, while the network continues to operate with the same reliability. Shutdown is limited to the initial installation, saving on the costs associated with downtime. There are four key elements offshore operators should look at when outfitting a digital oilfield. Accurately evaluate current application needs, but also look at possible upgrade scenarios to "future-proof" the oilfield and ensure it has what it needs for where it is headed. Many companies will buy a certain amount of equipment and then realize they cannot grow anymore and have maxed out their expansion potential. Build in or plan for expansion in the offshore oilfield. Evaluate the amount of time and dollars spent on manual updates, repairs, measurements and data collection versus investment in continuous collection of real-time data that can be evaluated off site. Is there is a way to centralize functions and find new points of efficiency? Assess the IT knowledge base and determine whether it is being adequately handled in-house, or whether it benefits the oilfield to partner with a third party, or use additional software or services to manage the oilfield. Thoroughly research wireless networks before selecting one to ensure it will stand up to the challenges of an offshore environment. With reliable real-time data collection and analytics, offshore oil and gas operators have new ways to succeed in tough offshore environments, keeping production high, downtime low, and worker safety and security protected - and innovating the industry. Josh Parker is ‎Director of Customer Support and Product Management at Rajant Corporation, a private wireless network provider and mobile networking pioneer.